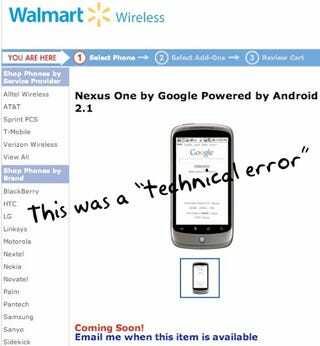 Walmart Not Getting Nexus One, Leaked Product Page Described As "Technical Error"
Walmart's told the Christian Science Monitor, of all people, that they won't be selling the Nexus One through its Walmart Wireless arm, despite a product page saying otherwise. That page has now disappeared, and blamed as a "technical error." Google&apos;s Nexus One On Sale At Walmart Wireless "Soon"
It could be seen as good news, or bad news. Giz commenter Aja175 summed the leaked product page up neatly with "Wow, there goes the nerd exclusive club. Nexus 1, coming to a trailer park near you!" after hearing the news two days ago, but there's no denying what Walmart's reach would've given Android.